Christmas Eve is tomorrow?! What?!?! Where has the time gone?! Have you planned out your Christmas morning breakfast yet? If you are looking for simple and unique, then you will want to keep reading on for today’s yummy recipe. 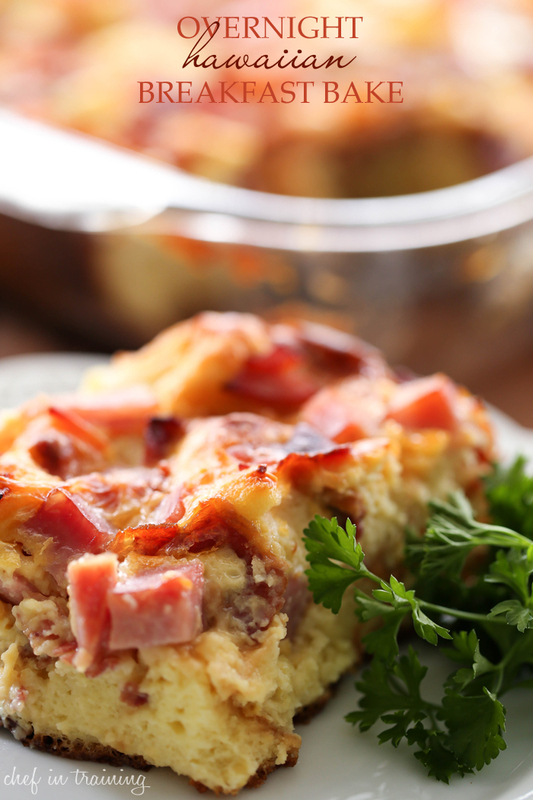 This Overnight Hawaiian Breakfast Bake is SO easy and the flavor is wonderful! It is very unique in that it uses Hawaiian Rolls as the bread vs traditional french bread, for a more sweeter and unique flavor. Bacon, ham and pineapple can be found scattered throughout in each and every bite complimenting and bringing to life the hawaiian flavor. All the prep work is done the night before making for one easy, pop-in-the-oven when ready to eat meal. If you are looking to cut some of the crazy out of your christmas- this breakfast is a great option! If your family is one that loves hawaiian flavors, then they are going to absolutely adore this breakfast bake! Thank you Nikki for the nice recipe. Merry Christmas to you and your family. I made this last night baked it for Christmas Eve breakfast. It pretty good it reminds me of a bread pudding. Hubby likes it, I omitted the Canadian bacon due to it already having bacon and ham. What can be used in place of hawaiian rolls ?